For many families, heading out into the forest the day after Thanksgiving and cutting down the perfect Christmas tree is a beloved ritual. "We do it every year as a family tradition," said Kent Fullenbach, spokesman for the Salmon-Challis National Forest. Fullenbach said he packs up his kids and grandkids for a short hike through the snow around Salmon, hunting down trees that will hold a place of honor in their homes for the holiday season. "It's just a lot of fun, and an opportunity to get out in the woods and hike around a little bit," he said. Residents are welcome to find the perfect tree on public land starting today, Nov. 18, but must pay for the privilege. For $5 per tree, households can purchase up to two tree tags and cut any designated species of tree on public land less than 10 feet tall. Julie Thomas, spokeswoman for the Sawtooth National Forest, said the permits are not always popular, but she expects a rush this year if weather conditions hold. "It's not for everybody," she said. "Right now, when we don't have a lot of snow, we'll see more people going out." Thomas said Fullenbach's chosen hunting day—the day after Thanksgiving—is the most popular day to nab a tree. But not just any tree makes a good Christmas tree, Thomas and Fullenbach said. Though any conifer would make a traditional Christmas tree, there is a difference between the Douglas fir and the lodgepole pine trees, the most common conifers on both forests. Fullenbach said his family generally looks for Douglas fir, which tend to be a little shorter and denser than their pine cousins. He said he's made lodgepole trees work before, but it required wiring in extra branches trimmed from the bottom of the tree to fill the holes. "Lodgepole is kind of your Charlie Brown Christmas tree," Thomas said with a laugh. She suggested heading to the north end of the Sawtooth National Forest for Douglas fir, while lodgepole can be found in the southern end. There are, of course, a few restrictions that limit tree hunters. Trees may not be cut down within 300 feet of campgrounds, streams, lakes or ponds, or within 100 feet of any main road. Cutting down lone trees is also discouraged. Thomas said there haven't been a significant number of reports of violations on the Sawtooth National Forest. When they do occur, she said, they happen during high-snow years when people without four-wheel-drive cars can't get far enough back to legally cut down a tree. "Where the road is still open, I don't think we'll have any problems," she said. Families can cut down trees between 10 and 20 feet in height but need to purchase a $10 rather than a $5 tag. Trees must also be cut below the lowest limbs near ground level—in other words, no cutting 10 feet off of the top of a 20-foot tree. Fullenbach recommends cutting down the entire tree, then shortening it at home. He said his family makes wreaths and centerpieces out of the leftover limbs. "It's great to make a little spray [of branches] for the tabletop," he said. 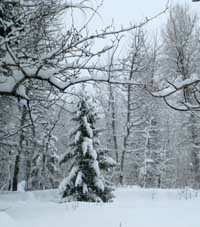 Cutting trees and decorating can be fun for the whole family, but Thomas urges tree hunters to use caution when driving out into the forest in winter weather. "Be prepared!" she said, urging families to pack extra food, water and a change of clothes in case of emergency. Permits can be purchased at the Ketchum, Stanley and Fairfield ranger district offices and at LL Green's Hardware in Hailey and the Camas Creek General Store in Fairfield. All locations will provide maps and tree-cutting rules to permit purchasers. Remember, Thomas said, there's more to tree-cutting than just taking home a conifer for Christmas. "It's not about the tree, it's about the outing," she said. According to the U.S. Fire Administration, Christmas trees are involved in roughly 250 home fires each year. Most fires result from open candle flames or electrical shorts in holiday-light wiring, but the administration's website reports that well-watered trees are almost impossible to ignite. The administration reports that a dry tree can blaze up within seconds of contact with an exposed flame or electrical current, and an entire room can join the inferno within 40 seconds. To prevent fires, keep trees away from heat sources, do not smoke near a live tree and do not keep trees up for more than two weeks. Check holiday light strings for fraying and ensure that the wires are not warm to the touch before placing them on a tree. The administration recommends keeping trees well watered. It reports that it attempted to light a well-watered tree with a propane torch and though the branch did ignite, it self-extinguished once the flame was removed.